A lot of people these days are on gluten-free diets, either because they can’t eat gluten, or because they feel healthier without eating it. But have you ever looked at the ingredient list of some of the gluten-free brownie mixes available in stores? Poly-ethyl-blah-blah-blah…no thank you! But how to avoid it? Well, let me tell you the secret ingredient that will make your life so much easier (and also more brownie-filled! ): OAT FLOUR! That’s right! In this recipe for Gluten-Free Chocolate Chunk Brownies, we’re subbing out the refined white flour (gluten-filled) for some oat flour, on a 1-to-1 basis. And bonus, YOU CAN MAKE IT YOURSELF IN ONLY 5 SECONDS! No need to buy a package of oat flour – just take some regular gluten-free oats and whizz them in the blender (or coffee grinder or spice grinder) for 5 seconds until it’s all powdery. Voila, oat flour! Easy, peasy, amirite? Ok, so I’ve told you how to avoid gluten when making brownies, but you still like the convenience of store-bought mixes? They are pretty easy to toss together, aren’t they? What if I told you could toss together this brownie recipe in two minutes – the same time it would take to mix up a batch of store-bought brownies? So maybe it takes 30 seconds more to make these brownies than a box mix, but if 30 seconds is the price to pay for healthier food, well, sign me up! Want to make some gluten-free (not that you’d know it) brownies? Let’s! These gluten-free brownies are super-moist, super-fudgey, full of chocolate chunks, and best of all, preservative-free! Mix honey, melted butter, eggs, and vanilla together. Add in oat flour, cocoa, baking powder, and salt, and mix until combined. Don’t worry if you think you can see a few oat bits – it won’t be visible in the final product. Stir in chocolate chips, and pour mixture into a well-greased 9x9 baking pan. These brownies are deliciously moist and chocolatey. And if you leave out the chocolate chips, they’re even refined sugar free! How awesome is that? If you like super-fudgy brownies (like me! ), take the brownies out of the oven 3-5 minutes early. They’ll seem a bit undercooked, but just let them cool completely before cutting them into squares. Then, revel in those delicious, moist, and fudgy brownies! If you make these gluten-free brownies, let us know in the comments how you think they stack up compared to store-bought mixes! 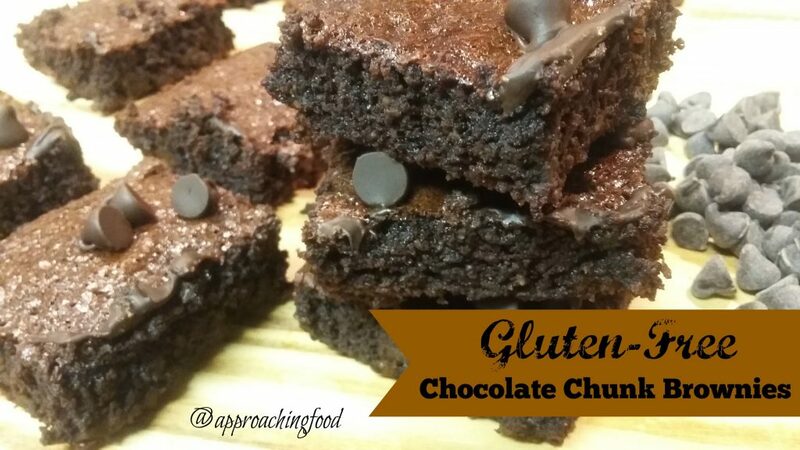 Isn’t it a good feeling knowing that your yummy gluten-free brownies are also preservative-free? And can you believe how easy it was to make that oat flour? Shockingly easy, right? If you liked this recipe, please share it on social media! I’m determined to share the word about how easy it is to go preservative-free – health is wealth, after all! Next Post: Pillar content! 5 Preservative-Free Lunches You Can Make This Week, as promised in last week’s post. Hopefully this week the baby allows me to spend a few hours doing the recipe reformatting necessary to make that post! Ah, that baby…so demanding, yet so cute! This entry was posted in Desserts Not Otherwise Categorized on April 15, 2019 by Margaret. Much more healthy than it tastes! While I didn’t grow up going to the neighbourhood potlucks or church suppers, I’ve certainly heard of the dishes that are infamous for being brought to those events. 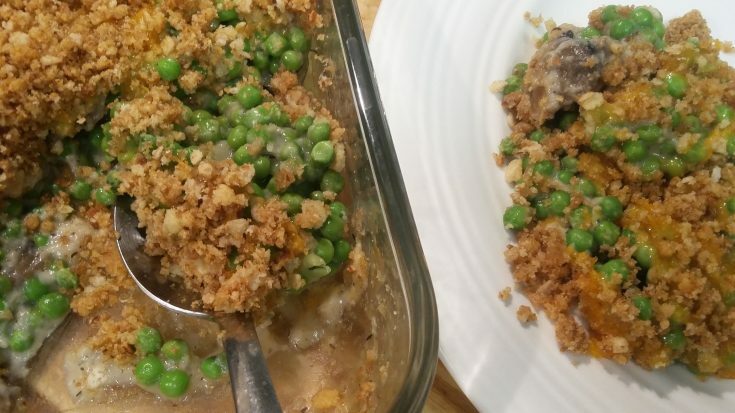 Case in point, that goopy mushroom pea casserole made with canned cream of mushroom soup and frozen peas, and topped with things like French fried onions. You know the dish I’m talking about? Easy to throw together and full of preservatives? What if I told you I have an EVEN YUMMIER recipe, AND it’s preservative-free? Well, I do! 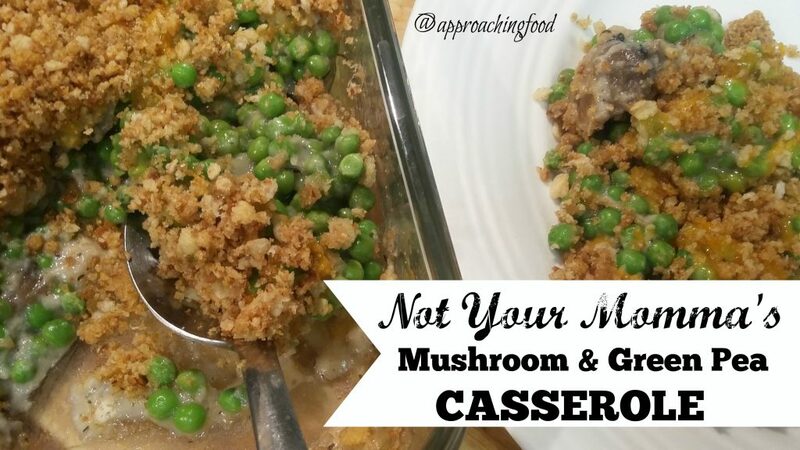 It’s Not Your Momma’s Cheesy Mushroom & Green Pea Casserole, and it’s oh emm gee so delicious! I mean, I didn’t grow up eating gelatin ‘salads’ and dishes like that, but there is something to be said for your classic comfort food dish. So why not make it healthier and just as delicious? This dish is also so, so, SOOOOOO easy to throw together! All I need for dinner! Basically, you mix together a batch of my homemade Knock Your Socks Off Cream of Mushroom Soup (way more flavourful than canned, not to mention healthier!) with some peas, top it with grated cheese, then buttered breadcrumbs, then pop it in the oven to bubble and sizzle and…you’re ready for dinner! Just think, chunks of real mushrooms mixed with sweet peas in a creamy, herbed sauce, topped with melted cheddar cheese and golden buttered breadcrumbs? This is a dish that makes me look forward to dinner, just so that I can have another serving! Shall we make some? Let’s! 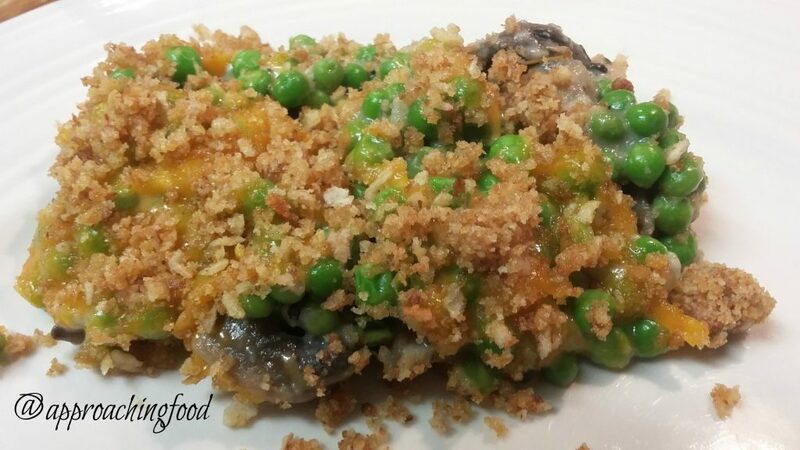 Chunks of real mushrooms mixed with sweet peas in a creamy, herbed sauce, topped with melted cheddar cheese and golden buttered breadcrumbs. Perfect for a large get-together or just cause you want some healthy comfort food! Butter a large lasagna-sized pan. Mix together the cream of mushroom soup and frozen peas. You can mix it right in the pan. Top with the grated cheddar cheese. Mix the breadcrumbs and melted butter together and sprinkle on top. Bake for 20-30 minutes in a 350 degree oven, until top is golden and you can see the casserole bubbling in the corners. Enjoy! 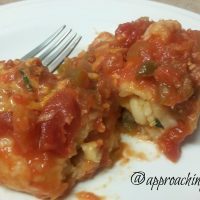 This recipe makes a large lasagna-pan-sized casserole, which means it’s great for large get-togethers or when you want to have leftovers to pack for lunches or just for another dinner. I like to eat this as a main course, since the peas are full of protein, so I check off my veggie and protein requirements with one dish, but I serve it as a side dish for my husband. Either way, it’s just super-yummy! I will say, if I don’t want to make a fresh batch of homemade cream of mushroom soup in this recipe, I’ve used leftover homemade soup that I’ve frozen and defrosted but it makes the dish a tad more liquidy, so keep that in mind. 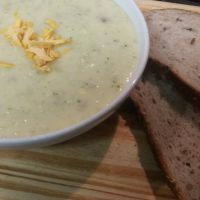 If you use frozen-then-defrosted homemade mushroom soup, you might want to let the dish sit for a bit after baking it, just so that the dish has a chance to set a bit. Or not. I personally have no patience for that, and will scoop it steaming into a bowl for me to gobble up, but hey, you do you, boo! p.s. – Want something bizarre yet charming to follow on fb? Check out the ‘Show Me Your Aspics’ fb group. So quirky and fun and light-hearted. Also addresses that age-old question of ‘If it’s made of gelatin/agar agar, can it still be a salad?’ What do YOU think? Let us know in the comments! Next Post: Another core content Pillar Post! This time I’m writing about 5 Preservative-Free Lunches that you can toss together this week, whether for work lunches, school lunches, or is-it-lunch-yet stay-at-home-parent lunches. This entry was posted in Uncategorized on April 7, 2019 by Margaret. 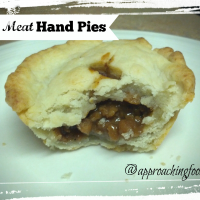 Yummy, homemade, preservative-free food that is also EASY to make? Is there such a thing? YES! You don’t have to be Martha Stewart in the kitchen to make lip-smacking food; you can be a beginner cook and still whip these up very quickly! Easy Enchiladas: A 20-Minute Weeknight Meal! Want Mexican food NOW but don't want the preservatives that come along with the plastic containers? This dish is as quick (or quicker!) than take-out! Craving pasta and sauce but not craving the preservatives that come in canned sauce? This classic sauce has wine added for a more adult flavour, but still manages to be healthy. 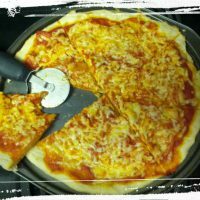 Want to avoid frozen pizza? This incredibly easy (and preservative-free!) recipe yields enough dough to make one large pizza, but is easily doubled. So it’s been a long week, and you’re tired and it would be so much easier just to buy something frozen and stick it in the oven. I get it! Hey, you don’t have to always cook everything from scratch. Start with smaller steps to going preservative-free and then build up. Case in point: my 20-Minute Enchiladas recipe uses canned salsa to make it super-easy to throw together. Could you make the salsa yourself to be extra-sure that it’s preservative-free? Sure. But making homemade enchiladas using canned salsa is still way healthier than buying those frozen enchiladas that are wrapped in plastic. So try these recipes for easy, yummy dinners, and revel in the fact that you’re cutting out preservatives! You got this! 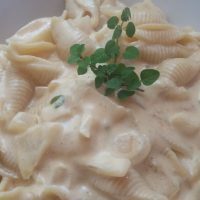 This entry was posted in Vegetarian Main Dishes on April 1, 2019 by Margaret.